For more than 50 years, Sterigenics has offered gamma irradiation technology as an effective and safe method for various types of pharmaceutical products. The versatility of gamma irradiation provides treatment for not only active pharmaceutical ingredients (APIs), but also final drug product formulations. Sterigenics’ gamma irradiation technology is used on many products such as bulk material (powders), terminal sterilization of APIs and lyophilized products, lotions, drug delivery systems, liquids, and non-proliferation of vaccines. Pharmaceutical companies are challenged daily with a focus of making their products sterile. 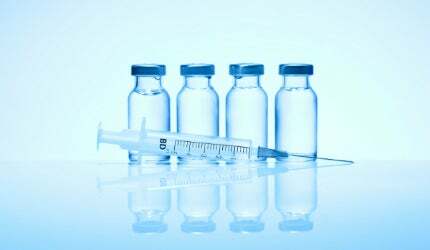 Human and veterinarian pharmaceutical manufacturers are required to sterilize products to eliminate any chances of a health risk. While achieving product sterility, they have to consider stability, potency, efficacy, and meeting important regulatory requirements. Sterigenics gamma facilities have irradiation containers that transport pharmaceutical products to the irradiation cell, which is protected by a concrete shield. Products are maintained in their case / cartons / drums. Cobalt 60 is the source commonly used to eliminate bacteria, fungi, moulds, and viruses in gamma irradiation facilities. When not in-use, the Cobalt 60 is stored in a deep water pool. As products are transported into the cell, the source rack is lifted. Energy rays attack the molecules, and the irradiation process does not leave any residuals or radioactive activity. Gamma deeply penetrates various products regardless of many different types of packaging, including dense products. This FDA-approved treatment meets regulatory requirements and guidelines. There are many advantages in using gamma irradiation on various types of pharmaceutical products. One key advantage is that gamma irradiation does not introduce heat or moisture. This is beneficial for bulk materials or drugs that are sensitive to higher temperatures. Specific dose levels and dose mapping provide the necessary documentation for companies achieving the desired sterility assurance level (SAL) and allows for terminal sterilisation. Dose uniformity is critical to successful results. From when they start developing their products, pharmaceutical companies must consider how gamma irradiation will affect the characteristics and performance. Gamma irradiation can not only affect the drug, but also containers and closures. Specific resins are sensitive to the irradiation process. Early development with Sterigenics consultants with testing and product tolerance is critical. Minor changes during development stages will enable terminal sterilization, and sterilizing the product in its finished form. With any sterilization method, undesirable affects have to be carefully monitored and eliminated when choosing the amount of irradiation. Many strategies are considered and applied during the testing process. Sterigenics consultants work diligently to reduce the risk of any degrading affects to the products. They assist companies to achieve the minimum dose required for sterility, but also test for a maximum dose, which keeps the product safe and effective. Sterigenics team of consultants work with an in-house laboratory. Determining your microbial load and bioburden initial counts is mandatory to determining dose ranges and maintaining the potency of products. The laboratory also offers accelerated ageing studies for finished products. By exposing the products in climate-controlled rooms, they advance the life of the product. Testing for sterility, embrittlement of the components, appearance, odor and more are all tested. This provides pharmaceutical companies with important shelf-life knowledge and lifetime of their products. Sterigenics has announced that it will be attending CPhI North America. and advisory services for the pharmaceutical industry. The Sterigenics CompactCell is a low-volume, high-precision irradiator designed to provide a higher precision dose than other commercially operated irradiators. Innovative solutions in sterilisation management are the result of synergistic partnership and state-of-the-art technology, supported by in-depth testing, experimentation and validation. Sterigenics has announced that it will be attending Pharmapack, Paris. Sterigenics has announced that it is building a new facility in Markham Vale North in Chesterfield/Derbyshire, UK. Sterigenics will be attending Interphex 2015 from 21-23 April at Javits Center in New York. Sterigenics International has announced its acquisition of Gammarad, Italy's leading gamma sterilisation provider. Niki Fidopiastis, SteriPro's consulting director, will serve as a trainer at the Radiation Sterilization for Medical Devices Training Programme from October 7-10 2014 in Alexandria, VA.
Sterigenics International has announced it has completed the $826m acquisition of Nordion Inc.
Sterigenics International has announced that it received ISO / IEC 17025:2005 food and chemistry accreditation in Mexico. Sterigenics has announced it will invest more than $10m to expand operations in Atlanta, Dallas and Belgium. Sterigenics has entered into a definitive agreement to acquire Nordion Inc.
Sterigenics International has announced it has closed the acquisition of Food Technology Service Inc.